The Satan worshiping mafia that seized control of the West’s financial system is literally offering the world to Russian President Vladimir Putin in a desperate attempt to keep in power, according to a gnostic illuminati grandmaster and an MI6 agent. That may be why Russia is officially going along with the obviously fake Boston bombing psychological warfare operation against the American people. It may also be why the green light has been given for Japan and Russia to settle a territorial crisis that has lasted since the end of World War 2. However, any role for Putin greater than what he has now is extremely unlikely since the US military is not going to go along with Zionist schemes any longer. It is also clear that a big showdown has secretly taken place in the US and the Zionists have blinked first and are now in a state of fear and submission. The evidence for this can be seen in many places. Instead, the world’s military and intelligence community has finally figured out that “Islamic fundamentalist terror” is run by Zionists and not Muslims. The crypto-Jewish Saudi regime is also now under severe attack for its role in financing mayhem and murder. All male descendants of the Original Saudi King will be targeted for assassination if they do not cease and desist immediately, according to several different secret societies, including the Green dragon. In any case, Zionist attempts to start World War 3 are failing on all fronts. In Asia a flotilla of Zionist flunkies sent off to provoke China over a few tiny rocks in the ocean is being ignored. Mass visits to the Yasukuni shrine in Tokyo by politicians have failed to provoke more than a rational response by China asking for a sincere debate about the historical truth. Attempts to start nuclear terror in Asia and blame it on North Korea have also been quashed. Instead Japan on April 28th Japan declared itself to be an independent country for the first time in 61 years. This ceremony officially celebrates the signing of the San Francisco Peace Treaty in 1952 but in reality celebrates Japanese independence this year from secret Zionist rule by murder, bribery, propaganda and blackmail at the highest level. The new move to strengthen relations with Russia is a good sign of that. The countries signed a peace agreement back in 1956 in which Russia agreed to return 2 of 4 disputed islands. The Japanese were forced to renege on this by the Zionists as part of a campaign to keep their Japanese colony isolated from its neighbours. Prime Minister Abe and President Putin have now announced they will work towards a peace treaty based on that previous agreement. That is why Russia and Japan have now agreed to go ahead and radically improve economic relations in the Far East. They have also agreed that, since they both share borders with China, they have a common interest in making sure China does not become a bully in the future. That is a far cry from the Zionist propaganda painting North Korea as a crazy regime bent on starting nuclear mayhem. It is also worth noting that the provocative US/South Korean military exercises have been stopped. It is also clear that the Zionists are no longer supported by the vast majority of Europeans and Americans, including the Jews. Instead people are waking up to their plans to create a one world “New World Order” totalitarian dictatorship. For example, a recent poll shows that the majority of French, Germans, Brits, Italians and Spanish do not trust the EU or should I say the EUSSR. It is also clear that the attempts to terrorize the American people into accepting totalitarian rule are failing. A recent opinion poll carried out after the Boston fake bombing psy-ops show that instead of increasing American’s willingness to “give up freedom for security” it did the opposite. There are also signs the Zionists are beginning to lose control of their magic money printing machines known as the Federal Reserve Board and the European Central Bank. Last week arch financial criminal Henry Paulson (Goldman Sachs, US Treasury etc.) and war criminal Henry Kissinger appeared on Xinhua news meeting Chinese President Xi Jinping. Chinese government sources say they were on a begging mission but were sent away empty handed. The same sources say the Chinese government believes the earthquake seen in China last week was caused by an earthquake weapon and was part of a failed attempt to extort money from China. The ongoing “bird flu” biological weapons attack against China is seen in the same light. The various bombs going off around the world are (Czechoslovakia, Iraq, Syria etc.) are best seen as the death throes of the dying Zionist terror machine and are part of a failing campaign to maintain control through fear. It is they who should be afraid because they are going down and going down hard. I may also mention to Bill Gates that I am sick and tired of my Hotmail account being censored and controlled. People who I meet and ask to send me e-mails call me on the phone regularly to say the mail has been bounced back with a message saying “there are problems with that e-mail account.” The only mails that do seem to get through contain warnings of nuclear terror attacks. My Skype account has also been similarly hacked. You are wasting your time Mr. Gates and Satanic friends, the only important messages I send are hand-written and hand delivered by personal envoys. The P2 Freemason lodge in Italy is admitting the “algorithms are broken” in the Western financial system and that some sort of agreement needed to be reached over the Global Collateral Accounts. They suggested contacting a certain Sultan in South East Asia. That message has been forwarded. It is time to end the financial war and cut off Zionist terrorist financing. The people of the world want peace. The systematic take-down of the criminal Sabbatean Satan worshipping Zionist cabal that seized power in the West through control of the financial system is continuing despite their ongoing threats of mass murder. The latest casualty, a victim of murder according to MI5, is Nat Rothschild, until recently the presumptive heir to the Rothschild dynasty. This information has not been confirmed by other sources but the most recent public appearance this writer could find of him on the internet was March 26th. If he was killed, then he joins the former Pope, 26 US generals, Queen Beatrix of the Netherlands and countless others in being removed from the apex of power in recent months. One possible hint that more cabal purges are in the works is the fact that Japan’s Imperial Household Agency has still not said whether or not the Crown Prince will accept an invitation to the coronation of the new Dutch King Willem-Alexander on April 30th even though an answer was supposed to have been given by the end of March. This may be related to an intensifying campaign to remove the Windsor (Saxe-Gotha/Rothschild) family from the British throne, the house of Saud from control of the Arabian oilfields and stooge president Obama from the White House, according to gnostic illuminati, MI5 and Vatican P2 lodge sources. The cabal has been trying desperately to start a major war to keep in power but nobody in control of serious military power is being fooled any more. The people in the pentagon know that it is the Zionist cabal that is behind both the North Korean nuclear threats and the talk of chemical weapons being used in Syria. They are not going to be manipulated into Zionist wars anymore, pentagon sources say. involved in the “October surprise” sabotage of the 1980 rescue mission of US hostages being held by the Iranian government, according to MI5. During the Iranian hostage crisis Ahmadinejad was one of the hostage takers. Ahjadinejad reported to CIA agent Tim Ozman (aka Osama Bin Laden) who in turn reported to George Bush Sr. during that operation according to both CIA and MI5 sources. Kerry worked on the US side of this operation to ensure the hostages were not freed until after Bush and Reagan were elected. It appears that Kerry’s visit to Asia was timed to coincide with a psychological warfare operation that was scheduled for April 13th but was aborted. Japanese TV stations had cancelled their regular TV programming for what was supposed to be a special announcement at 9 PM on the 13th. Several Japanese government offices also sent out false reports on that day that North Korea had launched a missile. However, nothing happened and the official North Korean news agency website was taken off the internet for a while when it became clear the North Koreans were no longer following the Zionist script. Obama’s messengers had given North Korea $3 billion to stage provocations but the North Koreans stopped cooperating when they found out that Israeli nuclear submarines were planning to stage nuclear terror attacks to blame on them, according to Japanese military intelligence. Here is a message to you Kerry: you are a common criminal and you are going to go to jail along with your Nazi buddies. Pope Francis has the idea that George Bush Sr. (Kerry’s boss) will be charged with something soon, according to an Italian aristocrat close to the Vatican. The new Pope also does not support Obama, according to this source. Perhaps that is why anonymous sources in the UK and Brussels fed a well-meaning but misguided group known as the International Tribunal into Crimes of Church and State (ITCC) information supposedly linking Pope Francis to the acquisition of Exocet missiles in Argentina during the Falklands war. While it is almost certain that P2 lodge members were involved in the missile deal, the Catholic church at the time spent most of its considerable energy and influence stopping the Argentine fascist junta from invading their neighbour Chile and trying to save innocent Argentines from regime murder squads. The new pope these days is evading his security guards and running around in a disguise of jeans and a sweatshirt trying to find out what is really going on, according to a Vatican source. It basically says the kingship was usurped centuries ago by Edward IV. Other sources, including the daughter of abdicated King Edward VII, say the line was usurped again in the 19th century by the Rothschild and the German Saxe Gotha families. This may all be true but, in Asia the belief is that whoever sits on the throne at present has the de facto “mandate of heaven.” It is up to the English people and the Privy Council to decide who sits on the throne. The increased attacks on the Queen may be linked to an intensifying investigation of the aborted nuclear terror attack on the UK Olympic Games last summer. The investigative trail has now led to former London Metropolitan Police Assistant Commissioner John Yates. Yates caused the wrongful arrest of the top SAS anti-terror agent in London by falsely blaming him of leaking information to the press that was actually leaked by Yates. Yates is now in Bahrain teaching the government there how to suppress demonstrators. Yates did a post-graduate in applied criminology at Cambridge along with Sarah Thornton, the woman who was promoted after UK bioweapons expert David Kelly was killed in her district. We have also been contacted by MI6 to let us know that when, as we reported previously, their agent Alexander Moore went to the Australian Embassy in Tokyo and asked them to inform Australian Prime Minister Kevin Rudd of an impending nuclear terror attack against Japan, the embassy never passed the information on to Rudd. Instead they sent it straight to Washington and that led to Rudd’s removal, MI6 says. Rudd himself was only aware of plans to use new energy technology to turn Australia’s deserts green. One final note, Google has been confirmed to be evil because it is actively hiding truth about cabal mass murder. That means several top Google executives are now destined for jail or even worse fates. Sabbatean mafia plans to stage nuclear terror, blame North Korea. The Sabbatean mafia that illegally seized control in the West is planning to stage nuclear terror attacks and blame them on North Korea, intelligence agency sources say. Google chief Eric Schmidt and basketball start Dennis Rodman recently visited North Korea as envoys of US President Barak Obama, MI6 and Japan-based North Korean sources say (shortly after Schmidt’s visit to North Korea, there was an attack on South Korean banking and media websites that was originally blamed on North Korea and China turns out to have originated in the US, most likely courtesy of Google). The visits were aimed at encouraging North Korea to make nuclear provocations so that it could later be plausibly blamed for nuclear terrorist attacks carried out by the Sabbatean mafia, the sources say. To under-score this, the Mossad linked website Debka.com had an article last week that basically threatened a North Korean nuclear terror attack unless Israeli interests were served. This is not even a fig-leaf of plausible deniability; why would North Korea risk nuclear annihilation to serve Israeli interests? Both the official North Korean News Service and the pentagon are dialing back tensions even as the Zionist media continues its hysterical campaign to demonize North Korea. The fact of the matter is that two Sabbatean/Zionist/Nazi submarines have been sent to carry out nuclear terror attacks to protect Zionist’s fascist rule of the West. The Navy Intelligence information/disinformation site Sorcha Faal says the submarines are likely to attack either Yokohama (i.e. the US Yokota naval base in Yokohama, Japan), Busan in South Korea, Portland Oregon or Los Angeles. Nobody will be fooled though and the Gnostic Illuminati are promising a retaliatory attack against Jerusalem if the Sabbateans try to pull off another nuclear terror attack. A South Korean government official also said his government knows North Korea is not planning any attack. The same cabal is spreading bio-weapons in China, dumping nuclear waste in Japan and threatening to trigger an earthquake in California in a sign of vicious desperation. The desperation is being triggered by an international dragnet that is closing in on them from all directions. are being carried out by multiple intelligence and police agencies using various covers. For example, the US agency backed hacker group anonymous has hacked Israeli database and found the names of 30,000 Mossad agents around the world. These names have been forwarded to the relevant authorities. Anonymous has also announced an attack on Israel’s web presence. The other big agency attack against the Sabbateans took the form of a release by the “International Consortium of Investigative Journalists,” of the names of holders of offshore bank accounts worth $32 trillion dollars (over twice the US GDP). Before the website was taken down and put up again in sanitized form, it released the details of accounts held by people like Barak Obama, Tony Blair, the Governor of the Bank of England, Hillary Clinton etc. For example, the Obama offshore account totals $30 billion and is held under the name Henry Ansbacher. The financial attack on the cabal is also intensifying. The widely reported physical gold shortages, such as the line ups at gold outlets in Thailand, are being caused by cabalists desperately trying to use their fiat paper currencies to buy physical gold. In the case of Thailand, the Saudi Royal family and their buddies the Bushes are working with Japanese crime syndicates to buy Thai and Persian royal family gold. The wife of the Prime Minister of a major Asian country even phoned this writer last week to ask where gold could be found (Hong Kong, Switzerland and Indonesia was my best guesstimate answer). In Japan, the big monetary easing announced by the Bank of Japan last week is actually a massive move to protect Goldman Sachs and the Rockefellers, according to the executive of a Japanese securities company. Goldman Sachs is in severe trouble in South Korea, Japan and elsewhere and is using yen in a desperate move to keep itself afloat, he said. “The entire South Korean financial system is controlled by Goldman Sachs and it is imploding under bad debt,” he said. A South Korean government official denied this. However, a White Dragon Foundation delegation to Seoul was recently shown photographs of large amounts of gold for sale supposedly held at a secret location in South Korea. However, the South Korean side, including representatives of the 6 largest conglomerates and the South Korean government, were unable to provide a photograph of a recent newspaper being held in front of the gold. There is also a desperate move by North and South Koreans in Japan to liquidate their yen holdings and either buy South Korean won or gold before their money is confiscated by the Japanese tax authorities, the executive said. The Japanese monetary easing and the attempts to grab Korean assets are a sign of desperation by cabalists stooges in the Japanese political scene who see their Sabbatean bosses being pulled down above their heads. A powerful plasma ball was spotted over Mt. 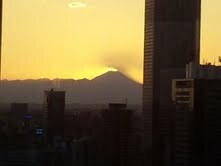 Fuji and photographed by this writer. The photographs clearly show the plasma burning over the massive volcano. The photograph above and the one below were taken from Shinjuku, near the Tokyo government office buildings. The photographs have raised suspicions of a HAARP attack by the cabal aimed at setting off an eruption of Mt. Fuji. To prevent this attack on Mt. Fuji from escalating, retaliation has begun with the stimulation of volcanic and earthquake activity around the Atlantic Canary Islands using highly classified technical means. Scientists have noted that if the La Palma rock formation in the Canary Islands falls into the ocean, it would trigger at 100 meter tsunami that would hit the East Coast of the United States, large parts of Southern Europe, West Africa and South America. To avoid escalation, the White Dragon Society strongly urges the cabal to cease all wars and peacefully surrender its criminal control of the Western financial system. the sun. More specifically, the pictures above are of the sun setting over Mt. Fuji and were taken by this writer last fall and saved for the April 1st edition of this newsletter. However, all jokes aside, the cabal really did threaten multiple times to trigger an eruption of Mt. Fuji using nuclear bombs that have been buried in four locations around the base of the mountain. The threats were withdrawn after counter threats were made to hit the La Palma rock formation with nuclear missiles. This is the kind of criminally insane activity the current leaders of the West engage in. The actual ongoing volcanic activity at the Canary Islands, however, appears to be entirely natural in origin i.e. an act of God. There is also a lot of seismic activity taking place in the financial world. The shutting down of the banks in Cyprus has apparently dealt a nasty blow to many groups of gangsters including, Sicilian, Calabrese, Camorra, Turkish and Russian mafia groups, according to an Italian P2 freemason lodge source. The more well connected gangsters were able to move their money out to Malta, Morocco and Tunisia, the source continued. Higher level players were able to take their funds out of Cyprus and into Switzerland, Lichtenstein and Luxembourg, according to an MI5 source. Honest businessmen in Cyprus, for their part, got thoroughly shafted. The Cyprus money grab has triggered, as mentioned last week, an escalating shift of funds out of Italy, Spain and other EU countries. Political chaos and unrest is also continuing in many European countries, notably Italy, which remains without a proper government. Both MI5 and P2 sources believe the situation in Cyprus was a proxy war between the Germans and the Russians but it is not clear at this point who got the better of the battle. However, the announcement by the 180 nation BRICS alliance last week that they were going to start a new development bank to replace the IMF and the World bank is expected to signal an intensifying financial boycott of the Sabbatean mafia controlled NATO terrorist states. The Russian move out of Cyprus before the banks were shut down is definitely connected to these moves. These same 180 nations have also publicly called for a fundamental reform of cabal controlled global institutions like the UN and the BIS. There is also a lot of high level intrigue continuing in the UK. The announcement that Jonathan Evans, the head of MI5, was resigning and being replaced by Andrew Parker, was highly irregular, according to an MI5 source. “Usually such a change is announced months in advance and a successor is announced weeks in advance,” the source says. The sudden announcement may be connected to the fact that Evans was clueless about the planned nuclear terrorist attack on the London Olympics, the source speculated. The other big development in the UK last week was that Prince Edward, the Duke of Kent and head of the Freemasons, had a stroke. This is unlikely to be a coincidence given the highly intense struggles that are taking place throughout intelligence circles these days. Speaking about intrigues, a very obvious and concerted campaign to feed alternative news media, including this writer, with misinformation is continuing. Once trusted sources have informed me of things like “Henry Kissinger had a stroke”, “Hillary Clinton had been arrested” etc. We could not verify this information and sure enough, shortly after the information was sent our way Kissinger and Clinton both appeared at public events. The report we made last week about senior Japanese pseudo-right wing politician Shintaro Ishihara being brutally murdered came from a trusted source at Japanese military intelligence. Ishihara, however, appeared on Japanese TV today after a mysterious two-week hospitalization. The intelligence source insists the person seen on TV was a body double but we have been unable to verify this at the time of writing. However, we can confirm from sources extremely close to Prime Minister Shinzo Abe that he has come down with cancer and suspects he was hit with a cancer causing virus during his recent visit to the US. Abe is now taking hemp extract and has been advised by this writer to take 5000 IUs of vitamin D3 per day and 1 gram of vitamin C every six hours to counter-act the cancer causing virus. There are also signs of a financial crisis brewing in South Korea, North Korea and Japan. This crisis has several interlocking dimensions. First of all, the Japanese government is considering passing a bill to tax all assets worth over 50 million yen (about $500,000) owned by South and North Korean nationals living in Japan. Since Korean gangsters seized large amounts of prime real estate near train stations during the chaos after WW2, huge funds are involved. That may explain why a several Korean groups are now offering to trade yen for won at a huge discount to the official exchange rate, according to a South Korean CIA source. That also explains a lot of the North Korean saber rattling in recent days since the North Koreans secretly control huge swathes of the Japanese economy and are understandably reluctant to have those assets seized by Japanese taxmen. In addition, there is a huge credit card debt crisis brewing in South Korea, according to a veteran Japanese securities company executive. South Korean women are being sold into prostitution around the world to pay for their credit card debt, he says, but this option is not available for other Koreans. He expects a major credit card debt crisis to hit Goldman Sachs in particular, very hard. The other crisis in South Korea has to do with bank loans, he says. Bank officers in South Korea with the authority to approve loans have been taking personal commissions of 10% or more on the loans they approve. This corruption is also leading to a bad loan scandal, he says.